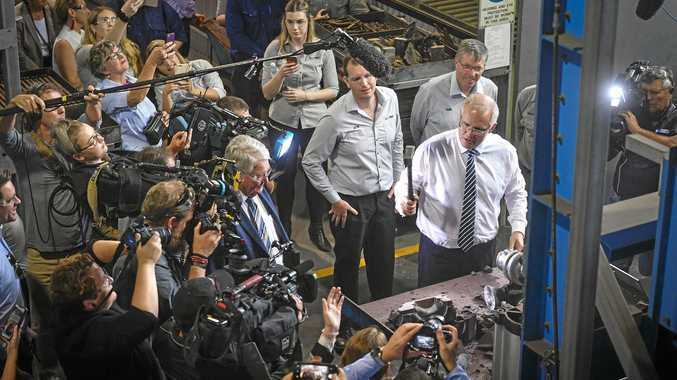 IT HAS been tagged the Labor-lite Budget and 7.30 host Leigh Sales wasted no time pointing it out to Treasurer Scott Morrison in his first interview on Tuesday night. "Could you be the first Liberal Treasurer in history to deliver a Labor budget?" she asked. In what has been described by political analysts as a bid by the Turnbull government to hit the reset button, Mr Morrison's second budget has sought to once and for all bury the Labor Party's election "Mediscare" campaign by guaranteeing the scheme. The Medicare levy has also been raised from 2 to 2.5 per cent to pay for Labor's National Disability Insurance Scheme, which will be fully rolled out by 2020, a raise that will impact nearly every taxpayer. But Mr Morrison denied the plans were Labor-lite, when grilled by Ms Sales. "These are principles that are very important to the Liberal Party. The NDIS is a shared commitment in this parliament," he said. "Every single parliamentarian feels very strongly about the NDIS and we have a shared commitment to make sure it's there with all people with a disability. "We have to fund the NDIS. "We've had a fights about funding for several years. It's time that the politics of that ends and we give disabled Australians and their families the guarantee they deserve." But Ms Sales pointed out a dramatic about-face from his first budget last year. "You say they're principles important to the Liberal Party," Ms Sales said. "You said in last year's budget speech now is not a time to be splashing money about or increasing the tax burden on our economy. Such policies are not a plan for jobs and growth. "Why such a drastic change?" "The only people paying higher taxes are large banks and the crackdown on multinationals and foreign investors," he replied. In perhaps the biggest surprise of the 2017 Budget, the Liberal Party has gone after the big four banks to wear the biggest share of budget repair. The new, seemingly minute levy of 0.006 per cent levy will apply to certain key funding sources, which will affect only banks with debts of more than $100 billion. This means it will impact only the four major banks, as well as Macquarie Bank, and is expected to raise more than $6 billion. Federal Budget 2017: What you need to know : News Corp journalists look at the key elements of the 2017 Federal Budget. Mr Morrison said the party changed tactics after the Senate blocked $13.5 billion worth of savings proposed in last year's Budget. However, he was less effusive when asked by Ms Sales if the banks would not simply pass the payment on to customers. "It's not a tax on bank deposits like the last one. It's not a tax on mortgages," he said. "The ACCC will be tasked to ensure banks do not mislead customers. "The ACCC will monitor them and consumers can move their money to a regional and smaller bank. "This isn't a tax ... on pensioner's bank accounts. This does not include people's deposit accounts or mortgages. "It doesn't include the regulatory required capital for banks to ensure they're unquestionably strong. This is a smart tax. "The banks are in a position to support budget repair and we're asking them to do so." Federal Budget 2017: the winners and losers: So who are the big winners out of the 2017 Federal Budget - and who will be worse off. Analysts have described it as much closer to the Labor Party values than the Liberal Party's, however, Mr Morrison also announced a crackdown on dole recipients, with 5000 random drug tests carried out each year at three locations. It is thought to be a bid to bury the disastrous 2014 Budget once and for all, the Budget where former Treasurer Joe Hockey infamously declared "the age of entitlement is over". Shadow Treasurer Chris Bowen said the Budget was an "attempted by failed catch-up with Labor" when he faced Ms Sales soon after Mr Morrison. "Whether it is health, where they have not fully unwound the freeze on Medicare, whether it is housing or where their policy is a damp squib with very little of a reality for young home buyers, they have tried to catch up with Labor," he said. "I accept that. But they have failed miserably." Mr Bowen said his party was still dissecting the increase to the Medicare levy, which it is proposed will raise about $8 billion. "On the Medicare levy we will take our time. It's a big decision. It's $8 billion. A tax increase which affects almost every working Australian," he said. "We're going to take a little bit of time to look at the implications and say more." Mr Bowen also said the party was yet to accept the Medicare guarantee fund proved there was no secret plan to abolish universal health care. "It takes more than some sort of fund. It takes values. It takes commitment. It takes commitment and values," he said. As for the levy on banks: "We're not going to stand in the way of it." 2017 Federal Budget: Winners and Losers: Who are the winners and losers from this year's federal budget? "You say they're principles important to the Liberal Party," Ms Sales said.